The ultimate question people often desire to know of investors or investment funds is what makes them so special or uniquely qualified to outperform the market. The investing landscape has changed dramatically over the past 60 years. Back in the 1950's, a young man by the name of Warren Buffett found his edge by essentially being one in a handful of people that truly applied statistical analysis in a market dominated by investment activity that focused its attention on the most commonly known stocks. Add to that a dose of market inefficiency that does not exist today due to the sheer number of market participants, and Buffett found himself in a money making playground. Nevertheless, Buffett was different than his mentor Ben Graham. While no one will question Graham's paramount influence on the success of Warren Buffett (not even the man himself), Buffett took the tools and built his own foundation. 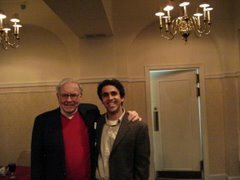 Buffett is indeed a value investor, but a unique one. Reading over his partnership letters, one can clearly see how Buffett developed his own style - his edge. Buffett's first edge was his classification of the three areas his participated in - workouts, generally undervalued, and arbitrage. But over time, his edge developed into other areas - control situations, buyouts, etc. Then he moved on to insurance, with gave him the edge of extremely low cost capital. In other words, Buffett created his own form of leverage. The rest is history. As Berkshire grew, so too did Buffett's approach to investing, dictated not by a deviation from his root principles of value, but via the need to properly allocate capital. Thus the key to successful investing is to develop an edge, but more importantly an edge than you can truly exploit in all environments. Occasionally investors will get thrown a year like 2009, when you can very easily find excellent business trading at substantial discounts to net current assets, P/E ratios of less than 4, or a ridiculous fraction of undervalued book value. In times like these, all one needs is to be ready to act quickly and decisively, and then sit still. However, during the 80% of the market time when prices are fairly valued at best, a clearly defined investment edge can set one apart. Indeed, value investing, practiced in its true form, is in itself a tremendous edge. The ability to buy unloved businesses or companies currently experiencing temporary problems is not something that relatively many investors can really do. The ability to do nothing while markets are very active is another tremendous edge. Nevertheless, 2008 showed how just about any approach to investing can suffer a setback. Indeed, while many who were fortunate enough to stick around after 2008 got a chance at retribution in 2009, I continue to refine my investment approach from the experiences of 2008. Like many value funds, we underperformed in 2008. And like many, we vastly outperformed in 2009. Even so, the thinking at Gad Capital has evolved. 6. Have the courage to make a significant investment at maximum point of pessimism. The order above is deliberate. You can do #3 without #2, and so on. However, seeing as my fund is relatively small in the investment field, I spend a significant amount of time looking where others simply can not look due to sheer size. For example, this year, we were still able to invest in a sub $10 million company with over twice its market cap in cash and no debt. As one of my potential investment partners told me last year at a meeting, "If the goal in investing is to make money, which is determined by investment returns, it seems to me that having a smaller sum of initial capital makes more sense in generating those returns." There's tremendous wisdom in that comment. Far few funds truly exploit the asymmetrical edge available when working with smaller sums. I know spend a bit more time exploiting this asymmetry. The other component, and one I have come to realize that I've underappreciated significantly, is the tremendous edge one gets when investing alongside quality management. By this, it's no longer enough for me that a CEO owns 10% of the company or travels coach instead of first class (although I value such alignment of interest immensely). Instead, I become very excited when I see extremely unusual behavior from management. For example, when a CEO of a company decides to borrow money to pay off his divorce settlement so he doesn't have to sell a single share of stock to raise money (true story), that grabs my attention. When a CEO flies across the country to buy a tiny business for $100,000 that is earning $50,000 in net profit, that grabs my attention. When a CEO decides to stop bidding on contracts to let his competitors take the bids because margins are exceedingly low or negative, that grabs my attention. In essence, this CEO is essentially doing something that will cause his share price to go down in short run, but does so because he knows that in the long run, his firm will be around to take the lion's share of projects when margins are again attractive. Management that behaves in such extraordinary ways usually produces extraordinary businesses in the long run. Such businesses can and should be held during any market environment. In essence, finding management of this type is like finding the best value investor in that industry. So yes, focusing on quality management is nothing new, but I'd argue that how to really examine management is not often done by many.